For adventure and nature enthusiasts alike, this is an activity not to missed when you’re visiting the mother city. 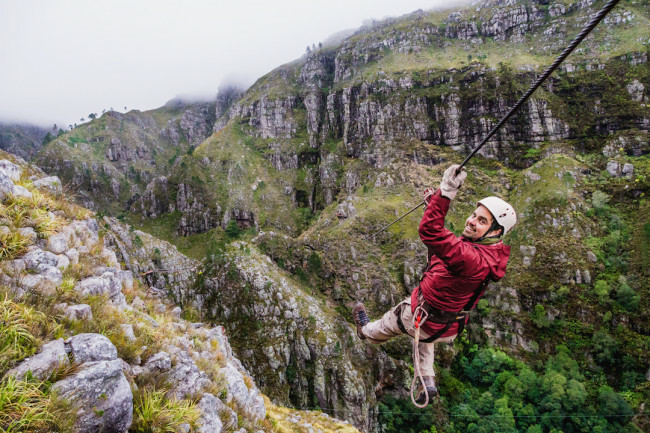 Situated only 1 hour from Cape Town in the scenic Elgin Valley, the Cape Canopy Tour is located in a World Heritage Site and offers their guests a way to experience an otherwise inaccessible pristine mountain reserve in a thrilling but safe adventure. After arrival and a comprehensive safety briefing, guests are transported to the peaks of the Hottentots Holland Mountains on a scenic 4x4 trip. This is where the real fun starts! 2 guides and a photo guide will accompany each small group (max 8) on an intimate and informative nature experience, as excited guests are taken sliding safely through the mountain along a series of zip-lines. There are 13 unique elevated platforms on cliffs and fynbos covered slopes to visit, including slides of over 300m long, a suspension bridge and a picturesque snack stop overlooking a double waterfall. After a short hike out, and a 4x4 trip back again, a light lunch is included on the decks of the Sunbird Café, where you can watch the videos and re-live the adventure whilst sipping on a cappuccino. Ages 5-75 are welcome, and rain gear is provided in wet conditions.